The Republic of the Ivory Coast (Côte d’Ivoire) is situated in West Africa. It is bordered in the south by the Gulf of Guinea (Atlantic Ocean), to the north by Mali and Burkina Faso, to the east by Ghana, and to the west by Guinea and Liberia. 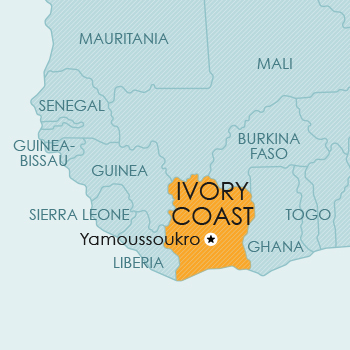 The government officially prefers the French name Côte d’Ivoire. Provision is made for copyright protection in OAPI member countries in terms of the Bangui Agreement. In Ivory Coast, a further copyright law was enacted – Law no 96-564 of 1996 on the Protection of Intellectual Works and the Rights of Authors, Performers, and Phonogram and Videogram Producers.